Bake cookies from scratch inside this interactive recipe book - sift the flour, whisk the sugar, crack the egg, pour the chocolate chips, and more! 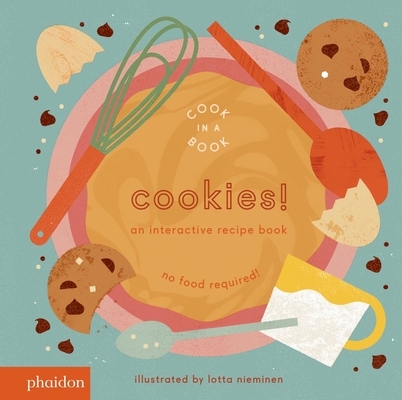 Simple yet factual recipe text takes readers through the steps of baking cookies, from combining the dry ingredients to pulling fresh cookies out of the oven, while the interactive features invite them to participate in the process. Move the sifter from side to side to separate the flour, turn the wheel to mix the batter, pull the tab to crack the egg, slide the oven tray out, and more! One hundred percent adult-free, danger-free, and mess-free - baking cookies has never been so independent! The fourth book in Nieminen's bestselling COOK IN A BOOK series. Lotta Nieminen is an illustrator, graphic designer, and art director from Helsinki, Finland, now running her own NYC-based studio. She has been nominated for Forbes magazine's 30 Under 30 list, and has received the Art Directors Club Young Guns Award. Her extensive client list includes Google, The New York Times, and Vanity Fair.